OWA’s Year in Review publication looks back on the key waterpower events, policy changes, technologies and initiatives that happened over the past year on behalf of its members. 2018 was a great year, full of success stores. 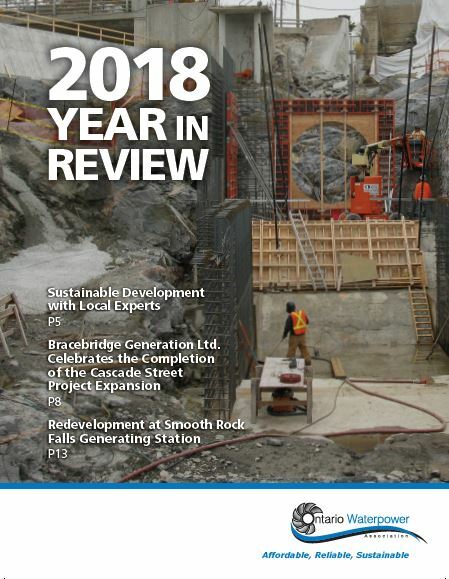 This issue highlights OWA’s new Strategic Plan and the annual Power of Water Canada conference. It celebrates innovative new waterpower facilities in Parry Sound, Smooth Rock Falls, Almonte, Oakville and Bala. It also features new fish passage focused on identifying invasive species and new debris management options for facilities.